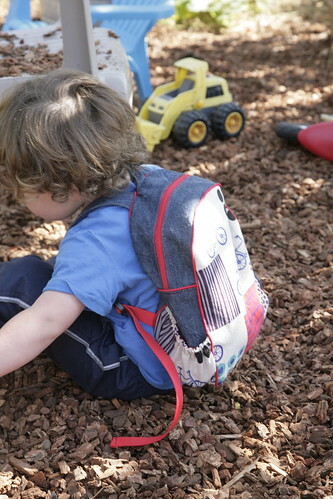 Inder Loves Folk Art: Getting Ready for Preschool: Toddler Backpack. Hi readers! How are you? I've been living in la-la land the past month (where did August go, anyway? ), enjoying Maggie, adjusting to life with two children, and desperately trying to keep up with our tomato harvest. September, and the start of school, seemed so far away. But last week, we attended a new-families picnic and several parent orientations at Joe's new preschool, and it hit home: My baby is starting school! On Tuesday! Whoa! I am excited and nervous for him. I hope he'll have a great time. I hope he'll make friends. Okay, mostly, I'm just hoping he'll be okay with us leaving him there on his own. Like any good seamstress mama, I channel my parental anxiety, concern, excitement, and pride into sewing projects, right? (This is just as good a method of dealing with anxiety as any other, I find. At least you end up with a handmade project at the other end.) So this week I decided that Joe must have a mama-made backpack for his first day of school. Never mind that I had less than a week to sew it, a 7 week old baby, and we were babysitting my niece for the better part of the week, leaving me with exactly no time to sew. The child needs a backpack, and that backpack needs to be made by me. Sometimes you just have to make the time. I used Rae's Toddler Backpack pattern. This pattern has been on my to-sew list forever and a day, and it is indeed wonderful. This was actually my first time working with piping (I know, I know!) and it went remarkably smoothly and turned out uber-cute. I'll be honest and admit I don't really love sewing bags - I find them fussy and a bit involved. But this backpack is really simple, basic, and doesn't require a ton of special hardware (just a little strapping and some strap adjusters). It's really the perfect size for Joe, too. 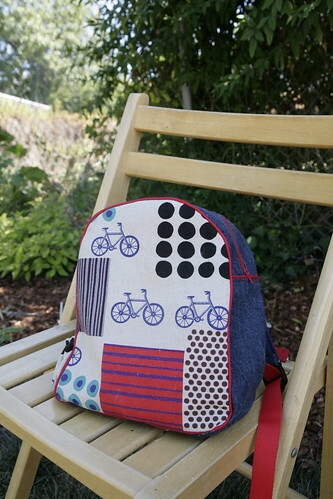 (And the pattern includes instructions on enlarging the backpack for a school-aged child.) The only changes I made were to interface all of the outer pieces with heavy interfacing (I would highly recommend this, by the way), and to add a few extra pockets. Because toddlers/preschoolers universally love pockets. For the side water-bottle pocket, I copied the style of the elasticized side pockets in Joe's Treasure Pocket Pants. Joe loves this style of pocket. I should put some on everything I make him! I also added a few smaller pockets (and a name tag) on the inside. The backpack is mostly denim, and the bikes are Echino (of course). All of the fabric and interfacing in this project came from my stash, so that was cool. Joe seems really excited about his new backpack and his new school. I've been prepping Joe for his first day at school by talking about the school routines: "You'll put your backpack in your cubby, play, eat snack, listen to your teacher tell a story, then say goodbye ...", etc. So now Joe tells me that toys go in the "tiny pockets" and lunch goes in the "big pocket" (er ... otherwise known as the main compartment of the backpack?). Then the backpack goes in his cubby. So we're getting there! 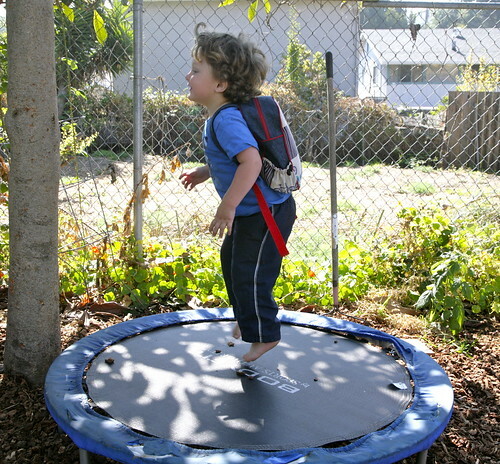 Of course, it was critical that the backpack pass Joe's "jumpability" tests. It did. Whew. 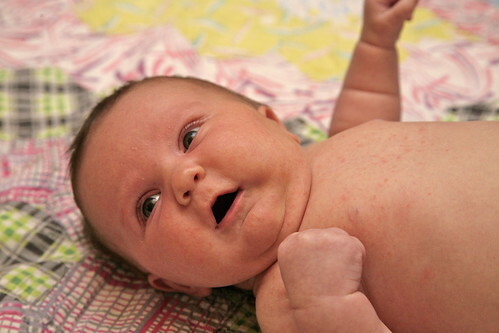 And because I know I haven't shared any photos of Maggie here in a while, let me conclude with a completely superfluous photo of sweet baby goodness. As Joe says, she is "tute, tute, tute!" No problem! Can't wait to see what you make for Elena! Great job on the backpack Inder! I totally agree with you about bag making...I'm not always a big fan...although, it seems that this might be a fun little one to try some day. I love you addition of the treasure pocket pockets!! I recognized them immediately! What a great idea to add them, b/c yes, toddlers do LOVE pockets, especially those! And, always love seeing baby Maggie pictures, of course!! After making the Treasure Pocket Pants and seeing Joe's response, it was like a light bulb went off. They are a cinch to make! And Joe LOVES them! Hmmmm. Oh, I love the elasticized pocket on the outside! We use those on all the other bags we have...why not add one on the backpack?! And yes indeed, Maggie is tute, tute! The side pocket is brilliant! And Maggie is so very tute! I hope he has a great first day! He is really loving preschool! What a relief! Thank you! Aww! Somehow I missed the livetesting phase of this! It's so perfect on Joe! Love the photo on the trampoline. What a gorgeous back pack. Super impressed! And Maggie is precious. I hope the settling in period is going well. Cheers! It's fabulous Inder! I know you say you're not that fond of making bags but you've done a fantastic job and made something really useful, which is I think, part of what I love about making bags - using them too. And I totally agree about sewing something to distract yourself, I definitely do that! Good luck with Joe starting school. I thought of you while I was putting this together. Like, hey, if she enjoys sewing bags, there must be something fun about it right? I think the hardest part for me is sewing these box like shapes and trying to get the corners right. But this backpack is mostly curves so it was actually quite a bit easier than a squared off bag. So that was really nice! And yes, he's using the bag every day he goes to school, and that warms mama's heart! I particularly admire the matching red zip, piping and straps! It's fab. And just the right size for him. Much tuteness! And yes, Miss Maggie is indeed tute, tute,tute! Muahahahaha. What is the sewing community if not a bunch of really bad enablers, anyway? This has been on my list for quite a while too. I really like the way you've mixed the denim with a print and it's such a great print. Love the side pockets too. Joe certainly looks very happy with it and Maggie is such a tutey. "Tutey!" She totally is. That's awesome. Oh,he is still so little! 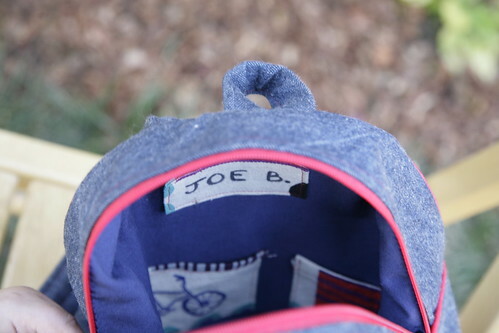 Good luck Joe,I love your backpack! You should make one! 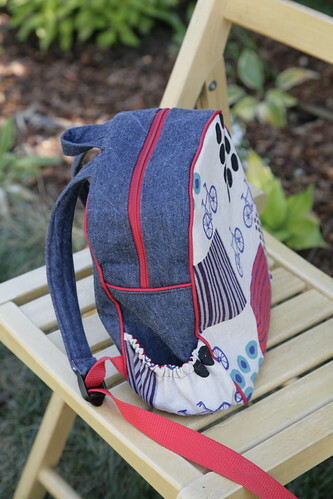 There's nothing like a mama-made backpack, right? And as mentioned above, there are easy instructions for enlarging it if it seems too small for her by next year ... otherwise, baby gets one in a couple years! Love the comment about chanelling angst into sewing. That just sums it up so perfectly. Such a cute backpack, that echino is perfect. Yours is lovely and Joe looks like he's enjoying it. If the issue is just size (I understand it may be more than that), Rae has an add-on (available free) that tells you how to simply enlarge the backpack for a school age child, so that it's large enough to carry regular size notebooks. Actually, I had forgotten that so will keep it in mind. I'm kind of a mean mum in that I don't buy my kids a new backpack or lunch bag every year. (Shock horror!) If the one they have is still fine, they just carry on using it into the next grade. My son is in 3rd grade and is still using the GAP backpack I bought him for kinder. I'm kind of interested to see if it will last through the whole of elementary school!